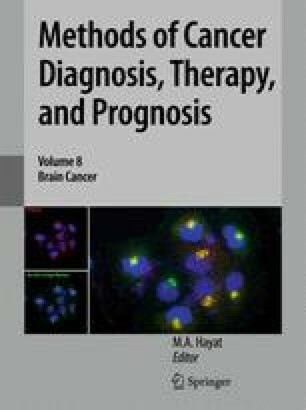 Diagnostic neuro-oncology practice has benefited in the last 2 decades from the incorporation of, and recent advances in, immunohistochemistry (IHC). Although the mainstay of brain tumor diagnosis including its grading remains conventional hematoxylin-eosin (H&E)-stained histology, it is no doubt that IHC plays a major role in differential diagnosis and in improving the diagnostic accuracy. It is generally used for purposes of (1) identifying tumor cell type/origin, (2) assessing cell proliferation potential, (3) evaluating the boundary between tumor and the surrounding tissue (i.e., tumor “margin”), and (4) excluding reactive processes (e.g., demyelinating and infectious diseases). In the future, novel antibodies utilized as prognostic, predictive markers and as potential therapeutic targets for brain tumors will be developed.